Get your organization on the fast track to an effective intranet. 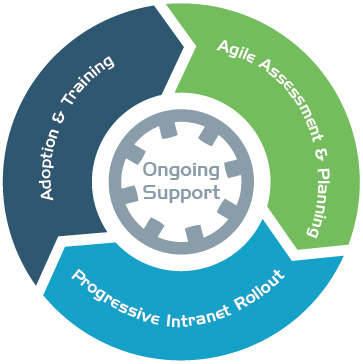 The Enterprise Intranet Portal Package includes agile assessment and planning services, a progressive intranet rollout, user adoption and training services, as well as ongoing upgrades and support starting at $2 per user / month. We get you on the road to an effective intranet with our agile assessment and planning service. Our world-class intranet team works with you to realize your business objectives and then deploys the foundation of your intranet. We will also deliver a blueprint outlining the evolution of your intranet. We work in conjunction with your change management process to ensure your intranet evolves to meet your organization's changing needs. Regular intranet checkups include assessment and planning touch points, performance reporting, roadmap revisions, product upgrades, and progressive rollouts. Many intranets fail because there is limited ongoing support and an ineffective adoption strategy. Our team provides ongoing services including a consulting helpline, SLA, and technical support, which drive participation and adoption. We are there every step of the way to deliver an effective intranet that everybody loves. To arrange a demo, or for more information contact us directly.